Brandon regularly contributes to Rowan magazine. He has many dedicated followers and is an inspiration with his passion for the craft of knitting and for his amazing skill at combining colours. 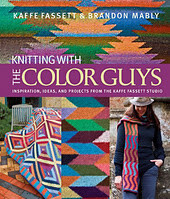 In his first book collaboration with Kaffe Fassett, his studio design partner, Brandon has recently published Knitting with the Color Guys. Next week I will have an interview with Kaffe. You can find Brandon here. Inspiration is found around every corner, from a row of chimney pots to a fruit market plus the old world fuel to the imagination by adding a new colour arrangement gives it fresh life. I knit to put colours together, basic stocking stitch is all that I need to do to hold the colours with an added technique or working with manageable lengths of yarn. I've noticed that you are focusing more on accessories. Could you tell us a little more? Our new book "Knitting with the Colour Guys' focuses on accessories and yes, Kaffe has designed sock yarn for Regia and we do throw it in here and there. It is a hugely popular yarn range. I love to see what's on the catwalk but otherwise I'm so wrapped up in looking at ideas I've picked up from museums, books, magazines or old textiles etc I don't really follow them. Check out my book 'Knitting Colour' Its all about where I get ideas and use them. It's a good workshop book too. Frankly, I don't take any notice. Knitters generally love to see something fabulous in colours so we give it to them. Vogue Knitting certainly don't restrain us or Rowan. Besides myself knitting up swatches I have 2 knitters I can hand my swatches over to knit into garments and write the instructions for. Pattern from Knitting with the Color Guys. There are many people I admire including Kaffe and Debbie Bliss. A lot, it's opened up one's profile to the world but also attracts a lot of time wasting questions and distractions. We provide a hand written graph to the publisher with a swatch or finished garment. Both Kaffe and I live for work but both exercise regularly. We make time for the theatre, cinema, exhibitions, as well. We don't work as 9 to 5 day though. Like anyone else, its hard to take. Because I live very simply not very long. Try and find your own voice. If you have the passion go for it!